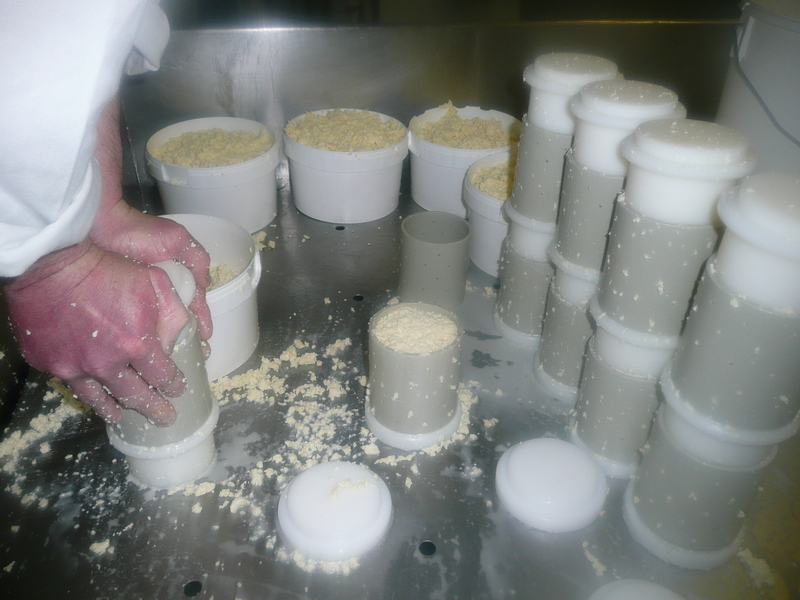 Some months ago, we started to talk to our ever-patient equipment suppliers, Brytec about how best to make mini cheeses. We know that most people mulch up cheese and extrude it, but we didn’t want to do this, because we didn’t want to alter the texture. Plus, most people make mini cheeses from returns and second grade cheese, where we don’t have returns or make second grade cheese. I like Brytec because they are down to earth, are extremely good engineers, know how we operate and that we are only small and new equipment has to be done low key and on a on a small budget. Also, we like making Brian crack a smile because he has a lovely smile, unlike his dog Tig, but we won’t go there. because we have coffee breaks and they have brew breaks (tea) but never mind….we finally hit on an idea: a vertical press and small mini moulds and custom made followers. We’ve already posted a picture of the press on this blog, but we haven’t shown it in action. Leading up to the Christmas period it was working overtime. 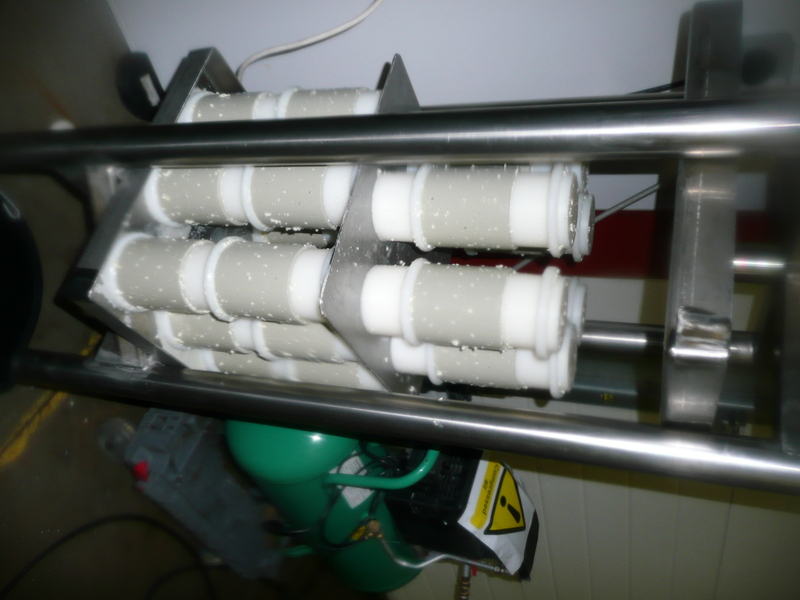 At the moment, we can fill 22 tall moulds (we cut them in half) with about 9kgs of fresh curd which makes 44 minis which we press for 24 hours, but we can do this three days on the trot using fresh curd from the vat, making 132 minis at a time using about 27kgs of fresh curd in total. 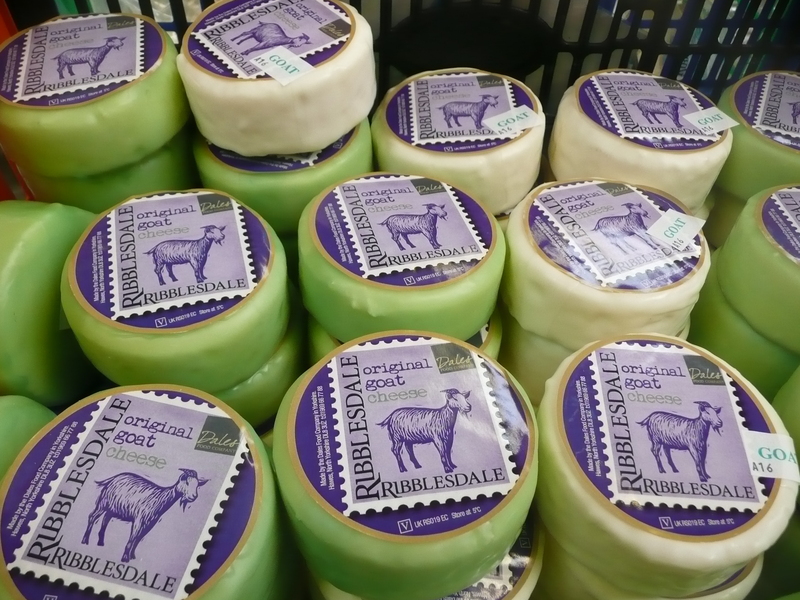 We make Wensleydale minis and Original Goat minis and they come in 220g – 240g hand waxed truckles. Most of our customers do not know we do them, mainly as we needed them ourselves, but we are slowly starting to tell them. They sell extremely well in the shop, in fact, over Christmas, I ran out of them. hand filled – we’ve given up weighing them as we can get them to be approximately 220g when waxed; hand waxing minis is time consuming. 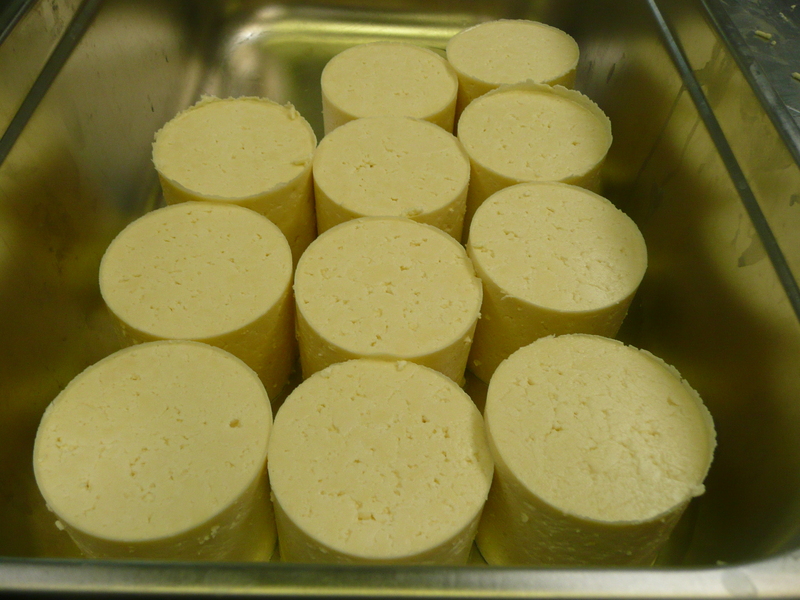 The upsides are that we use fresh curd in them, the same as our normal cheese, the texture is great as in our normal cheese and they look fabulous. We sell a lot of these in our shop as they are a great size and weight and customers love them. Stuart has some cunning ideas about ‘things’ to put in cheese, such as apricots. That is next week’s plan. We are frequently asked for Wensleydale truckles with fruit in them in the shop. Each time, I sigh, (it’s not cheese!) still, if this is what customers want……. For whatever reason, the mention of fruit truckles has reminded me I have a load of wild bilberries stashed in the freezer – I must get around to using them!